To continue with my visit to the Chicago Botanic Garden…With so much to see and only a few short hours, I decided to set some priorities. 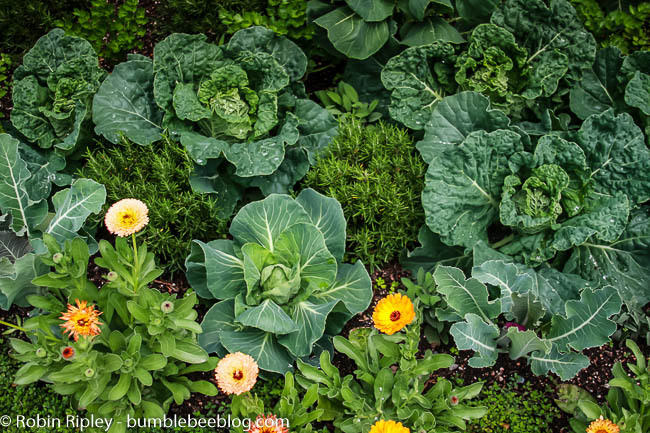 Since I’m in the throes of my own vegetable garden maintenance, I first headed over to see how the professionals fashion and keep up a vegetable garden in the summer heat. It seemed that everyone else had the same idea, because the place was packed with people ogling tomatoes, leering at berries and salivating over apples. The entrance takes you over a foot bridge and past a bed of miniature sunflowers that were in their glory. I couldn’t help myself snapping photos of other people’s children who were entranced by the sunny flowers. Just beyond the entrance and to the right is one of the most clever combinations of flowers and vegetables that I have ever seen. The fascinating mixture of cabbages, primroses and golden coin (I think) topped a concrete retaining wall that surrounded espaliered apple trees. Mixing vegetables and flowers isn’t at all a new idea. Our Colonial ancestors mixed all sorts of plants into a pleasing and workable jumble. But this combination was, I think, absolutely artful. 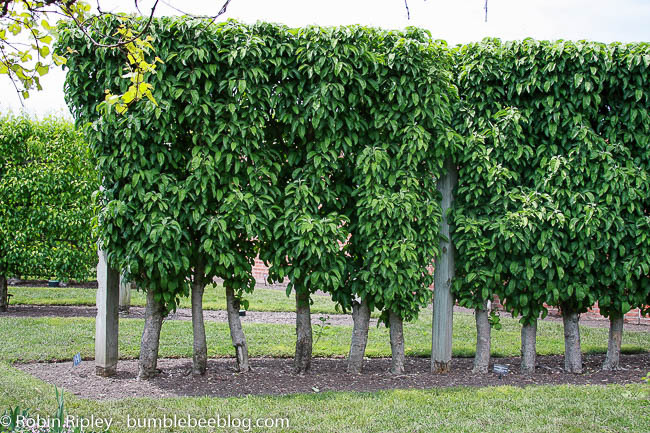 Whoever planned the vegetable garden at the Chicago Botanic Garden has a real fondness for orderly fruit. 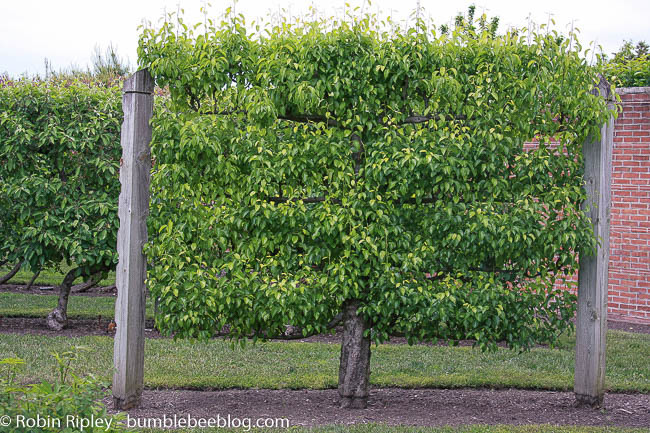 There are rows and rows of espaliered apples, espaliered pears and colonnaded apples. They even have whipped rangy raspberry and blackberry plants into submission into orderly rows, climbing obediently up trellises. I envision a jack-booted gardener with a crop patrolling up and down to ensure no one gets out of line.